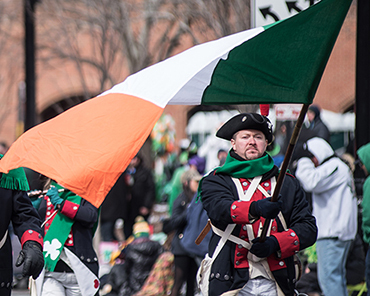 * WHEN IS THE ST. PATRICK'S DAY PARADE? * WHAT TIME DOES THE PARADE START? The Parade begins at 11:00 a.m.
* WHAT HAPPENS IN THE EVENT OF INCLEMENT WEATHER? The parade is a rain or shine event. However, when public safety is an issue, the parade reserves the right to reschedule to another day. * WHERE CAN I PARK? Click Here for a listing of Hartford Parking Lots and Garages. * ARE THE BARS OPEN FOR THE PARADE? Yes, check with your favorite one for their list of hours and events. * IS THERE TAILGATING BEFORE THE PARADE? Yes, but we do not sponsor or host any events. You are on your own on this one. * WHAT'S NEW AND EXCITING THIS YEAR??? NEW this year will be the recognition of Spectacular Spectators! Immediately prior to the parade step off, and on air broadcast, the Parade’s SHAMROCK SQUAD will search out Spectacular Spectators lining the parade route. They will identify and recognize winners in the categories of Spirit, Family AND Tailgaters. There is no application and no need to register for the contest. When you see the SHAMROCK SQUAD GOLF CART along the route, show your spirit, your family or your tailgate set up.